The C-SPAN Archives records, indexes, and preserves all C-SPAN programming for historical, educational, and research uses. Every C-SPAN program aired since 1987, from all House and Senate sessions in the US Congress, to hearings, presidential speeches, conventions, and campaign events, totaling over 200,000 hours, is contained in the video library and is immediately and freely accessible through the database and electronic archival systems developed and maintained by staff. Whereas C-SPAN is best known as a resource for political processes and policy information, the Archives also offers rich educational research and teaching opportunities. This book provides guidance and inspiration to scholars who may be interested in using the Archives to illuminate concepts and processes in varied communication and political science subfields using a range of methodologies for discovery, learning, and engagement. Applications described range from teaching rhetoric to enhancing TV audience’s viewing experience. The book links to illustrative clips from the Archives to help readers appreciate the usability and richness of the source material and the pedagogical possibilities it offers. Many of the essays are authored by faculty connected with the Purdue University School of Communication, named after the founder of C-SPAN Brian Lamb. 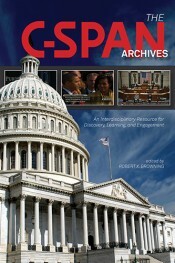 The book is divided into four parts: Part 1 consists of an overview of the C-SPAN Archives, the technology involved in establishing and updating its online presence, and the C-SPAN copyright and use policy. Featured are the ways in which the collection is indexed and tips on how individuals can find particular materials. This section provides an essential foundation for scholars’ and practitioners’ increased use of this valuable resource. Parts 2 and 3 contain case studies describing how scholars use the Archives in their research, teaching, and engagement activities. Some case studies were first presented during a preconference at the National Communication Association (NCA) convention in November 2013, while others have been invited or solicited through open calls. Part 4 explores future directions for C-SPAN Archive use as a window into American life and global politics.